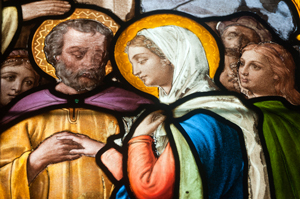 St. Joseph is known for a number of things: he is the just man, the husband of Mary, the patron of a happy death, the patron of the Universal Church. But there is another fact about St. Joseph that is frequently overlooked. Apparently St. Joseph liked to take naps. Those who worry and fret frequently find it difficult to sleep. Those who trust in the Lord are able to lay worries and anxieties aside, relax, and “rest” in the Lord. St. Joseph faced some major concerns in his life: his betrothed wife was found to be with child; the lives of his wife and foster son were threatened by a jealous king; he found himself an exile in a foreign land. And yet, in spite of these problems, St. Joseph was able to relax and to sleep. According to Scripture, the main way St. Joseph finds out about God’s plan is through dreams. While he rested in the Lord, the solutions to his problems were revealed. Let us ask St. Joseph to teach us how to place all of our worries and concerns in the hands of the Lord. Perhaps we too can take a trusting nap.